Nearly one year after starring together in 100 Tula Para Kay Stella. 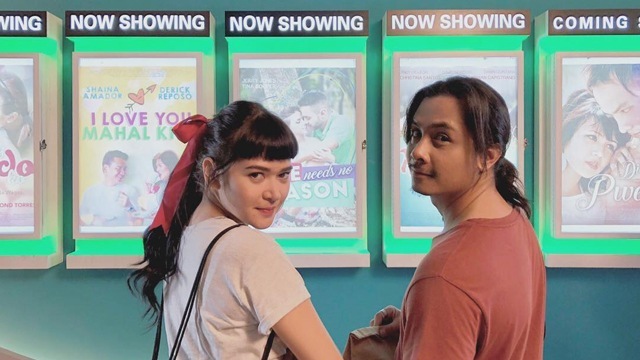 (SPOT.ph) Bela Padilla and JC Santos aren't new to sharing the big screen. They have, after all, starred in 2017's 100 Tula Para Kay Stella from Jason Paul Laxamana. After the film grossed over P95 million in just one week, fans have since been clamoring for them to get back together. And it looks like that's finally happening because Padilla and Santos are once again working with Laxamana on a new romance flick entitled The Day After Valentine's. The movie will be produced by Viva Films. Laxamana has been posting photos of the two leads as early as April. And it looks like Fidel and Stella (their names in 100 Tula Para Kay Stella) are now Kai and Lani. The film's stars seem to be just as excited as the director because both Padilla and Santos have also been posting photos of their time on set. There aren't many details about the movie yet, though some of Laxamana's captions on Instagram have been hinting at some lines in the movie. In one photo, he captions it with what seems to be dialogue between the two characters. One person says, "Basta ba okay tayo sa isa’t isa, bakit naman papalpak?" To which another person replies, "So you guarantee na hindi papalpak?” And it's continued with a hugot-worthy line that says, "Malay ko. Pero willing akong sumabak kahit walang guarantee, basta ba game ka." In another set of photos where Padilla is lovingly looking at Santos in the background, the caption reads, "Kapag na-in love ka sa isang tao, usually nagkakaroon ng tinatawag na 'halo effect.' Siyempre, dahil gusto mo siya, positive lagi ang tingin mo sa kanya. Wala kang nakikitang negative sa kanya. Or nakikita mo, but you choose to justify them. Or even ignore them." There's no set date for the premiere of the movie just yet, but maybe we'll have to keep posted on their Instagram accounts for more details and possibly more heartwrenching lines.